Today has been an odd one. Looking back at the posts on this blog, you’d be forgiven for thinking aren’t most for me. Our builder arrived and proceeded to measure me, “Aspetta,” (wait) he said as I walked away after he determined I was 1.557m tall, he then measured the length of my foot, then made me walk normally, stopping me he then got down on his hands and knees to measure the length of my stride. He makes a remark about measuring an other part of my body, then screws up his eyes and laughs at his own joke. I tell him, I think he’s a nut job and leave for the bank in Lanciano. Now initially, I’d been led to believe that in Italy, it costs more to withdraw cash in person rather than use an ATM. Turns out that whoever passed me that nugget of information was wrong. At our bank cash transaction at the sportello (banker’s window) cost nothing, unlike cash machines. I collected my cash from the very pretty girl and am leaving when Massimo, the manager appears, he calls me over and we exchange morning pleasantries, he asks if I’d like a coffee, I say yes and he opens a door to let the person the other side that he’s popping out for coffee. I peer in and sat at the desk is a woman who is the spitting image of Marge Simpson’s sister Selma Bouvier: the one with the parting in her hair. The woman stands up and despite not being bright yellow looks even more like her cartoon doppelganger. I want to laugh but this would be rude, so I cover it by pretending to sneeze and go outside to wait for Massimo. Coffee over, I drive back when the iPod shuffles and Barry White, begins to sing Can’t Get Enough of Your Love Babe, as his bass laden voice fills the car I smile wondering what our builder’s up to back at the house. He calls me Barry White, I asked him why once and his answer was simple yet honest, he said because you are named Barry and you’re white. You can’t say fairer than that. 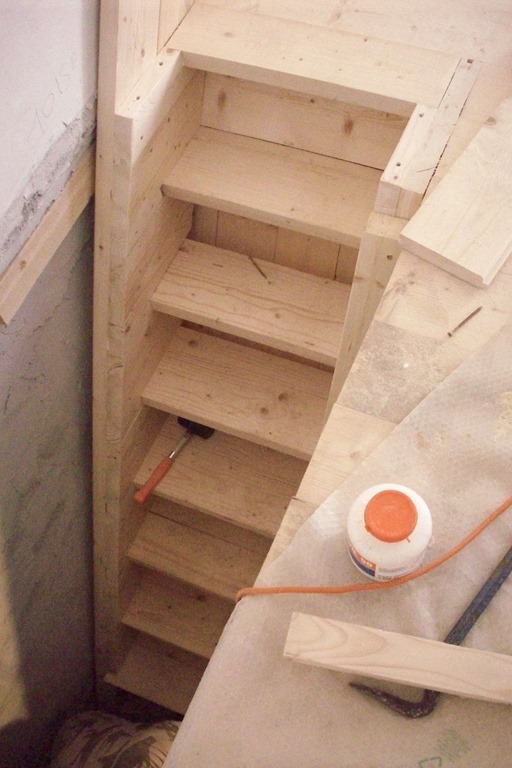 I get back and the result of all the measuring is revealed the staircase has been started to be installed. He explains that being a big man he had to get the headroom correct, I in turn correct him and explain the phrase is tall not big, he says why, because he’s a small man. I explain that small and short are different words in English, he then says he has tall feet for a small man. We laugh and I give up correcting his English, even when he says for a tall man my feet shouldn’t be so short. I’m tempted to tell him size 8 (42) is average, but realise that I’d be unable to explain why in this case short and small are correct usage when talking about feet, but not when talking about his height. The day ends and after he’s gone, I spend my time walking up and down my bespoke staircase. You see I’m easily pleased.